Homegirl London’s Room Edit: Happy Yellow Living Room Ideas. There’s no reason why you can’t bring the sunshine inside event when it’s cold out. The Spring / Summer 2017 catwalk trends were awash with yummy yellow. If you want fashionable interiors, perk yourself up with my Yellow Living Room Ideas. I’ve picked out a yellow velvet sofa and armchair plus yellow floor angle lamp and a few yellow patterns combined with grey for a gorgeous contrast. 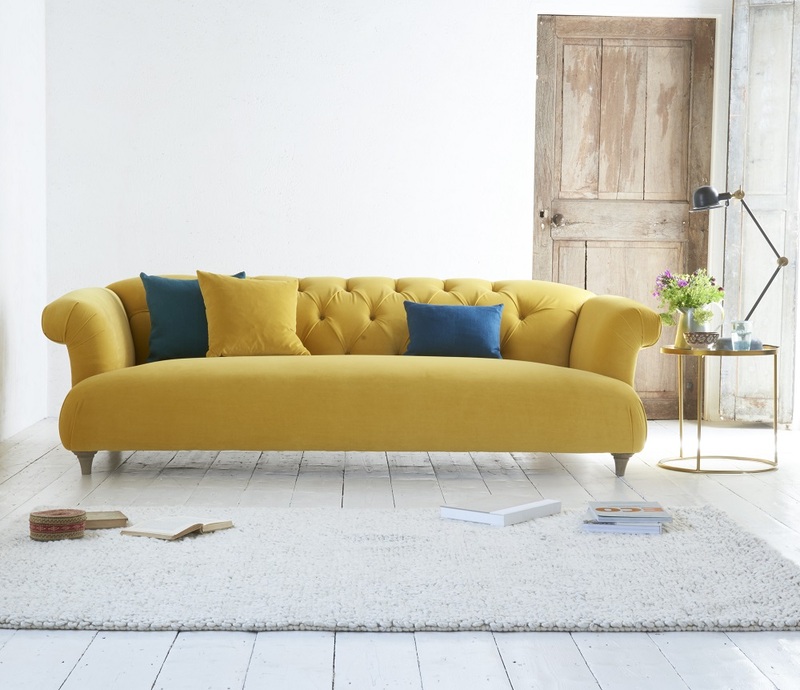 Loaf Dixie Sofa: Sink back into this beautiful bumblebee clever velvet upholstered deep buttoned sofa available in armchair to grand size couch, £995-1595 plus fabric price from Loaf. Floor Angle Lamp: Light up your living room with this giant vivid yellow light, £109 from Barker and Stonehouse (product code YELOS031ST61). Home Vinyl Matt Emulsion Paint: Love your lounge with a lick of this sweetcorn paint which you can apply to the ceiling or walls, £13.99 for 2.5L from Wickes (product code 122327). Orla Kiely OK Cushion: Brighten up your sofa or armchair with this yellow patterned cushion made using 100% cotton, £35 from Amara (product code OKCOKYE). Loaf Doodler Snuggler Armchair: Roomy bumblebee clever velvet upholstered armchair with pleated round arms and a plump cushion, £1199-1249 from John Lewis & Partners (product code 87029830). Onix Yellow and Grey Triangles Rug: Brighten up your floor with this geometric patterned flat weave rug, £101.95 for 160x230cm from Kukoon. House by John Lewis Stripe Yellow and Grey Throw: Keep warm with this 100% cotton throw which you can drape over your armchair for a burst of colour, £50 from John Lewis & Partners (product code 60346510). You can buy all these lovely yellow products mentioned in this feature from the following online retailers. Author: Homegirl London. Thanks: No one assisted with this feature. Prices correct at time of publishing but please check online for current prices. Product codes noted where provided. Photographs: Loaf, Barker and Stonehouse, Wickes, Amara, John Lewis & Partners and Kukoon. Disclosure: This feature includes the following affiliate partners – Barker and Stonehouse, Wickes, Amara, John Lewis & Partners and Kukoon (if you click through from my website and purchase items from the affiliates I will earn a small commission).